The question of how Micheal Bloomberg will spend his weekdays after he finishes running this thankless city now has a partial answer. After returning from his “first vacation in twelve years” (a golf-oriented jaunt to Hawaii and New Zealand), Bloomberg will devote some of his energies to Bloomberg Associates, a newly created “high-powered consulting group to help him reshape cities around the world,” reports the New York Times. The organization (which the billionaire almost-former mayor will, of course, fund himself) will employ “at least half a dozen top aides” from his administration. (It will eventually have a staff of 20 to 25 people.) And — in what the Times cutely described as “a twist on the traditional business model of consulting” — Bloomberg Associates’ services will be free. While the details are still vague, the firm’s purpose is to help governments from “Louisville, Ky. [to] Mexico City” carry out projects modeled after the signature policies Bloomberg brought to New York, such as installing bike lanes, revamping outdoor spaces, and discouraging the consumption of unhealthy things like cigarettes and trans fats. The idea seems like a natural step for Bloomberg, who has already “mentored” dozens of other mayors at City Hall, while his charitable foundation has handed out large grants to improve other cities. (And don’t forget about Mayors Against Illegal Guns.) “Under this mayor, New York is the epitome that cities look to of how to get things done,” said city planning director Amanda M. Burden, who intends to join Bloomberg Associates. Of course, not everyone in New York currently agrees with that statement, but longtime Bloomberg girlfriend Diana Taylor is someone who thinks that will change soon soon enough. “I think that at the end of a third term, I don’t care how good you’ve been, people are looking for something different,” she told the New York Daily News in a rare exit interview. 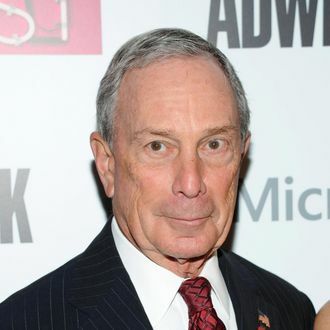 “And I think as time goes on, there won’t be so much ‘anti-Bloomberg.’ It’ll be ‘We just wanted a change,’ which I can understand.” In the meantime, we’re certain people in other cities will be more than happy to have him.